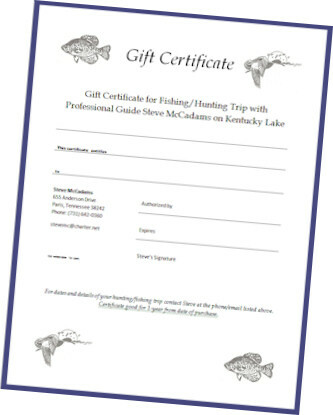 Want to send someone special on a fishing or hunting trip with Professional Guide Steve McCadams at Kentucky Lake? It's a gift where one size fits all! Great for special occasions such as Father's/Mother's Day, Birthday, Anniversary, Graduation, or just because that person is a good friend. Contact Steve via email or phone to purchase and he will send signed certificate with personal note to the person/location of your choice. Specific dates and details of the trip can be arranged with Steve by the recipient within 1-year of purchase date.